US PRESIDENT DONALD Trump is set to deliver a primetime address to the nation on immigration as he pushes for a showdown in his battle for a controversial US-Mexico border wall. Trump’s plans for a national address at 9pm (2am tomorrow Irish time) and a trip to the actual border on Thursday raise the stakes in the row with congressional Democrats refusing to fund his wall project. The stalemate has led to a partial government shutdown now in its third week. Democratic leaders responded to Trump’s planned speech by calling for equal airtime to rebut the president’s “malice and misinformation”, though it is not yet clear how major networks will respond. The events – giving Trump the national stage against two very different backdrops – give him a chance to try to seize the narrative. Those powers would in theory allow Trump to seek alternative funding for the wall and possibly free him to reopen parts of the federal government shutdown as part of his row with Congress. So far the White House has given no heads up regarding the details of Trump’s message. Trump simply tweeted that his address from the Oval Office tonight will cover “the Humanitarian and National Security crisis on our Southern Border”. Thursday’s trip, his spokeswoman Sarah Sanders said, will be to “the frontlines of the national security and humanitarian crisis”. The exact destination was not made public. “President Trump keeps rejecting the bipartisan House-passed bills, which have already received strong bipartisan support in the Senate, to re-open the government,” said a joint statement by House Speaker Nancy Pelosi and Senate Minority Leader Chuck Schumer. “Now that the television networks have decided to air the President’s address, which if his past statements are any indication will be full of malice and misinformation, Democrats must immediately be given equal airtime,” they added. The border has indeed for years seen significant numbers of illegal immigrants and a thriving drug trade. However, fact checkers have debunked the more hair-raising claims, including those regarding terrorist threats. Most recently, Sanders claimed on Sunday in an interview on the usually Trump-friendly Fox News channel that “nearly 4,000 known or suspected terrorists come into our country illegally”. However, the interviewer immediately called her out, citing the government’s own information that none of those individuals arrived across the southern border. Democrats, who won control of the House of Representatives in midterm legislative elections, say Trump overblows the “crisis” and call the wall a political stunt not worth taxpayer money. In retaliation, Trump has refused to sign a wider spending package – leaving sections of the federal government without funding and hundreds of thousands of employees facing delays in their paychecks. The US president has meanwhile sought to end fears of an abrupt US pullout from Syria, saying the fight against the Islamic State group is not over and that withdrawal would be done in a “prudent” manner. 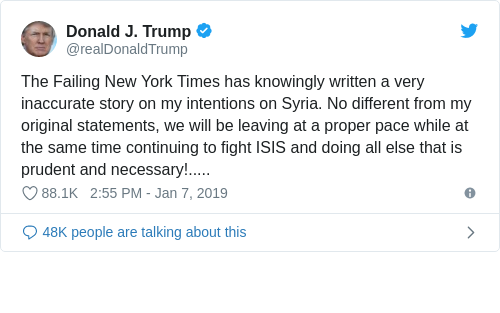 In yesterday’s statement, Trump complained that media coverage had skewed his original words, saying that his latest position on Syria was “no different from my original statements”.